Most people wouldn’t think of their garage as part of their home. It’s usually thought of as an out building, owing to the fact that, among other things, the surface in the room tends to be rough, stained and beat up from having a vehicle parked on it. This doesn’t have to be the case. 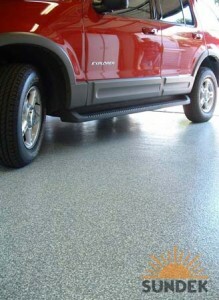 Garage floors coatings can provide concrete floors with a very smooth and inviting surface. With the right concrete coatings, garage flooring can be very easy to clean and very resistant to stains. Epoxy floors and alternative finishes can provide concrete floors with a very comfortable surface. In fact, with the right surface material, concrete floors can be kept clean enough to walk on in your bare feet or socks, depending upon what you have in your garage, of course. Concrete coatings make it easy to clean up messes from cars, and they preserve your garage flooring. When materials such as anti-freeze, traction enhancers that are sprayed on highways and other contaminants soak into concrete, they can damage it. The right garage floor finish makes it easy to wipe these materials up, protecting your surface. If your garage flooring needs some work, remember that having concrete coatings applied to it can give it a whole new lease on life. Not only do they improve the condition of the concrete, they also allow you to update it to reflect more closely the aesthetics of your home. Adding paint chips or other materials to garage flooring can give it a bit of color and sparkle that makes your garage into an entirely new space. There’s really no reason not to have a garage floor finish on your concrete floors. If you’re parking your vehicle on them and if they’re being exposed to the elements, the coating will provide a great deal of protection in addition to an updated style.